Revel in the romance of British Racing Green. 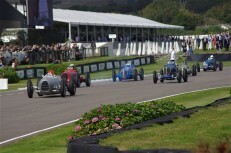 For three fabulous days in September, The Goodwood Revival transports guests back in time. The era is post war to the 60’s – filled with sights, sounds, fashion and food of the time, the focal point of the event is the world’s only completely original racetrack. Current stars from Formula 1 jostle for position on the track with legendary drivers from the halcyon glamour days. Sir Stirling Moss, John Surtees, Sir Jackie Stewart and Damon Hill pilot some of the most historic vehicles still racing. Values of these rare machines tops £100 million, with you and your guests having the opportunity to get up close amongst them in the paddocks. The Goodwood Revival is completely unique – not only is it by far the largest and most exciting historic motor race meeting anywhere, but also the only international sporting event in the world held entirely to a period theme. The sight of over 80,000 people dressed in period attire has to be seen to be believed and every year more visitors embrace the occasion and “dress the part”. Closing the gates on the modern world, you and your guests will take a magical step back in time where Spitfires & Hurricanes roam the sky overhead as gentlemen racers do battle on the circuit.